Projects Abroad offers numerous student volunteer abroad opportunities across the world, from Africa to Asia, throughout the year. We have hundreds of different projects that cover a wide range of fields and students can select one or several programs that best fit their interests, personal goals, and skill levels. For example, pre-med students applying to medical school often opt for an international medical internship to strengthen their applications, and students looking to enter careers in Early Childhood Development or teaching choose to participate in a Care or Teaching Project. With flexible start dates and durations, students can choose when they want to join and leave their project, from as little as one week. Most of our programs require no previous experience or special skills and students can join a Standard Project from the age of 16. A group trip is a great way for students to explore the world together with their peers and friends. Projects Abroad has options for students seeking a customized group trip experience with their classmates or friends. We can also organize group volunteer trips for students in middle school. Students ages 16-19: our High School Specials take place from 1-4 weeks on fixed dates in the summer, spring, and winter. These trips are specifically designed for teenagers and first-time travellers and volunteers have constant guidance and supervision. High School Specials are also helpful for contributing to community service credit requirements. Students aged 19 and older: Our 19+ Specials are designed for any volunteer over the age of 19 who is interested in a group volunteer trip abroad over the summer. This is a great opportunity for anyone interested in using their time and energy to give back, learn something new, and experience something different. Students of all ages: a Winter Break Trip is a good choice for students looking to escape the winter chill and participate in worthwhile volunteer work. Students can join trips for either two or four weeks. 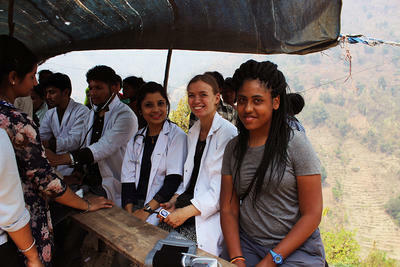 Whichever option you choose as a student volunteering abroad, you will become part of a volunteer community committed to positive change and sustainable development throughout the developing world. Your student years are a time of learning and discovery – take advantage of the opportunity to volunteer abroad and expand your horizons!